Braydon was born with a right clubfoot with 7 external toes. Surgery was done on Feb. 29, 1996 to repair the clubfoot and reconstruct a big toe. During the surgery they found bone structure for an eighth toe! Braydon's heel cord is still very tight, even after two release surgeries. He will need more "fine-tuning" surgery at some point in the future. September 2007 update... Braydon had surgery on Sept. 4, 2007. He had a tibial derotational osteotomy and an 8-plate procedure done on his knee. The goal of the surgery was to put his leg/knee in a better alignment, before we figure out what leg lengthening procedure we're going to do. The osteotomy brought his foot forward to a straighter position (see cast in photo below). There are two pins in his leg keeping the tibia in the right position. 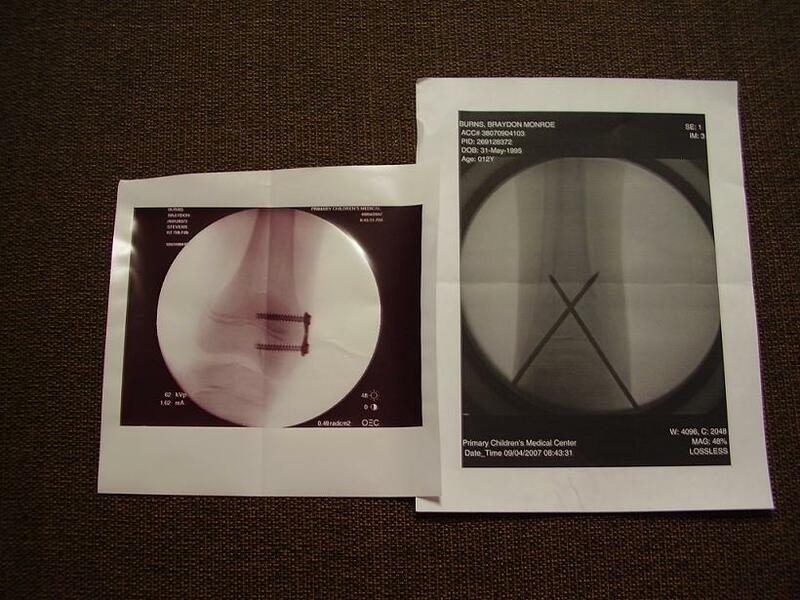 The 8-plate is a plate and 2 screws that were placed in the growth plate of the inside of the knee. In the next 6-9 months, as he grows, the leg should be straight! No more knock-knee (genu valgus). Braydon's right foot has done well, but has continued to regress from his clubfoot correction surgery. He has no dorsiflexion in his ankle because of a tight heel cord. 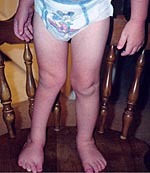 On March 1, 2004, Braydon will have surgery to "clean out" the ankle joint, and have another heel cord release surgery. 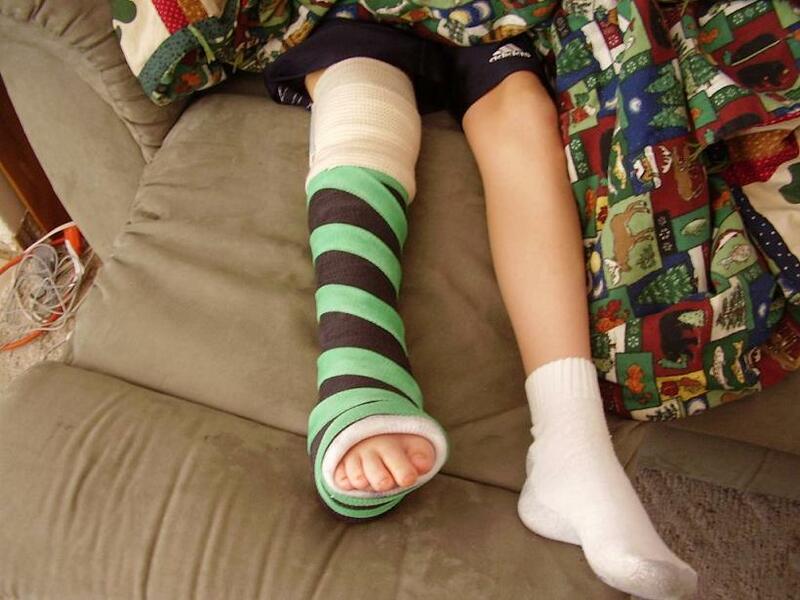 He'll be in a cast for about a month. They will be doing this surgery at the same time they are going to do his next VEPTR rod expansion/exchange surgery. Surgeries #14 and #15. I'll post an update after the surgery. Braydon's foot before surgery. Count the toes! We had fun making up extra verses to "This Little Piggy"! 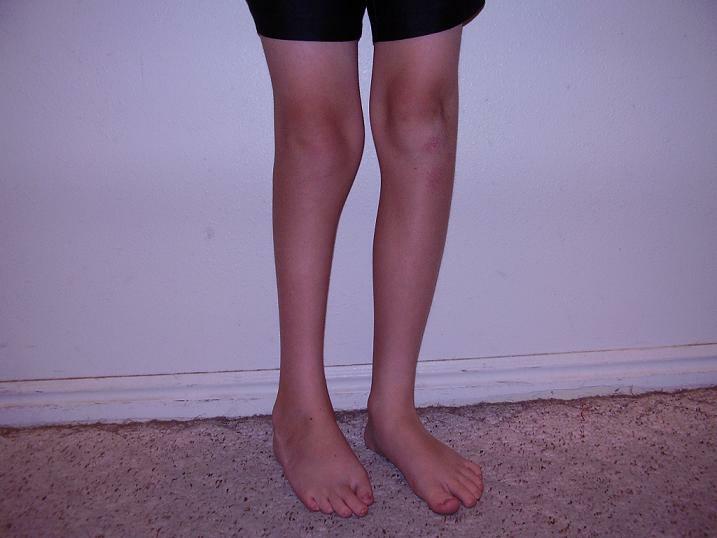 Taken in September 1998, these photos show the typical leg that many children with clubfoot/feet have. Because of the toe repair, Braydon's big toe on the right foot will never be as fully developed as the toe on the left foot. This photo was taken 2-1/2 years after his reconstruction surgery. The scar begins just under his big toe and goes around the back of his ankle to the other side. The redness is the area where they removed the extra toes. These photos were taken in Feb. 2002. You can see the skinny calf, knock-knee, and slight in-toeing of his clubfoot leg. 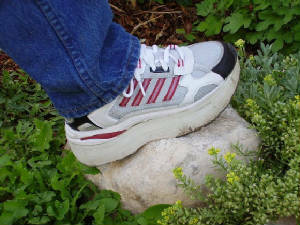 The pics with his shoes on show his 2cm lift in his right shoe. Since February, he has needed another 1cm added to the lift height, and his in-toeing has gotten worse. Braydon's legs just before surgery - Sept. 2007. See how the knees seem to both point to the right, while the feet point to the left? 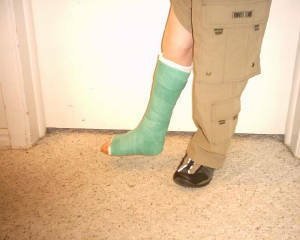 This picture above shows Braydon's foot and leg in February 2004, just prior to his surgery on March 1, 2004. His heel cord is very tight. He tip-toes on his right foot, even with the appropriate sized lift in his shoe. Braydon had surgery on March 1 to re-release his tight heel cord. The surgeon said that when he clipped the tendon, he was still unable to manipulate Braydon's foot into the right position (no dorsiflexion at all). The surgeon had to chip away the scar tissue behind the tendon and release the tendon from the ankle. He also went into the ankle joint and up between the tibia and fibula to get more scar tissue cleaned out. Even then, he was only able to get Braydon's foot to 90 degrees, still no dorsiflexion. After re-positioning the foot to 90 degrees, they didn't have enough skin to close the incision. They had to be creative and do a "Y""V" closure - cutting up (vertically) then cutting a "Y" shape at the top to bring enough skin down to close. 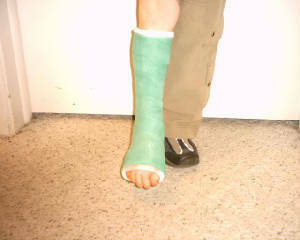 Braydon was then put in a cast (green - his choice). The cast comes off on April 6 - we'll be anxious to see how it looks. At our appointment in April, we will talk about putting him in an AFO or DAFO to keep his heel planted with each step. I'm not sure exactly what the plan will be. Operating room xrays of Braydon's surgery (9-4-07). 2 pins are keeping his ankle/tibia in the right position while his foot heals in a new place. And, the 8-plate and 2 screws in the growth plate of the knee.